Recently I have read an article about hyperacidity. As what I found out from the article is, young generations often suffer on hyper acidity than older generations. Why? Most of us eat spicy and sour foods which are contributing factors of hyper acidity. Hyper acidity is the excessive secretion of acid in the stomach in which this is due to acidic food intake, tension, less fluid or water intake ad lack of exercise on the body. There are common home remedy and suggestion for relief of symptoms. Relaxation ad regular exercise is helpful for people with hyper acidity. Practice a healthy meal time habit and healthy food intake. Drink enough water every after meals everyday. Avoid eating spicy and even hot foods that can trigger the acid in the stomach. Regular inhale and exhale exercise to release the gas and acidic odor in your stomach. There are also neutralizers that can help relieve the symptoms and pain in hyperacidity. Good diet. An organic food or vegetable such as, carrots and cabbage juice daily to neutralize the acid in your body or stomach. However, when symptoms will become severe, you can take olive oil, one teaspoon thirty minutes before meals to neutralize the acid. Avoid fruits that are acidic in nature, such as oranges and lemon that can aggravate the condition. 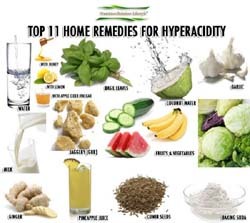 Hopefulyl these useful tips can help you to overcome your hyperacidity problem. If you are interested my other posts, please visit my site.